Corn syrup is a viscous food syrup made from corn starch (maize starch). It contains varying amounts of glucose (dextrose), maltose and dextrins, depending on the grade. Corn syrup is also known as glucose syrup to confectioners. Corn syrup is made by hydrolysis of corn starch. In simple terms, this means breaking down starch into simpler sugars like glucose and maltose, using water and catalysts. The resulting syrup is colourless and transparent and the main ingredient is glucose (dextrose) hence the name’ glucose syrup‘. In the US, glucose syrup is made from cornstarch (maize starch) hence the name corn syrup. Glucose syrup can also be made from starch extracted from other cereals like wheat and rice. Corn syrup is used widely in the food industry for sweetening soft drinks, baked goods, alcoholic beverage, sauces like ketchup, most prepared foods and pickles. 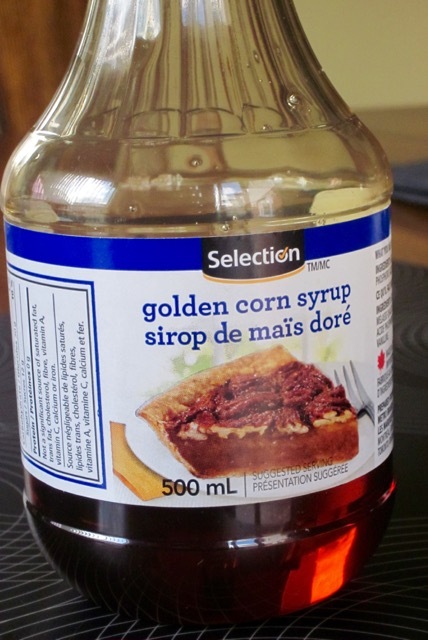 For home use, corn syrup is available in two flavours, the light coloured corn syrup and the golden or dark coloured corn syrup. The main ingredient in light coloured corn syrup is glucose which is a monosaccharide sugar. Glucose is less sweet compared to fructose so this syrup will be less sweet than table sugar which is made up of glucose and fructose in equal quantities. Pure corn syrup is colourless, transparent and flavourless. To make it have more flavour and colour, molasses or blackstrap molasses is added to produce the golden or dark coloured corn syrup. Sugar may also be added to make it sweeter, and artificial flavour, to give it more flavour or aroma. I suggest you read the label on your product to see exactly what has been added to make it ‘golden’ or ‘dark’. What is light corn syrup used for? In general light corn syrup can be used as a sweetener, thickener or to retain moisture in baked goods. Light corn syrup is used in baking for making fondant icing. It can be used to make home made candy. What is dark or golden corn syrup used for? Can be used as an all-purpose sweetener. Perfect for desserts, candy bars and glazes. Corn syrup is used in commercially prepared foods as a sweetener, thickener, and humectant (an ingredient that retains moisture and maintains the food’s freshness). It’s also used to prevent crystallization of sugar, and to enhance flavour. Corn syrup is the primary ingredient in most brands of commercial “pancake syrup”, as a less expensive substitute for maple syrup. Corn syrup was the primary sweetener in the United States but now HFCS high fructose corn syrup, is preferred as a sweetener. Corn syrup is used to make High fructose corn syrup by converting some of the glucose in glucose syrup into fructose, using an enzymatic process. This results in a much sweeter product. Glucose is also known as dextrose or grape sugar. In food labels it may be listed as dextrose or’ grape sugar.’ It may also be listed as ‘corn sugar’, wheat sugar or ‘rice sugar’ depending on the source of the starch. Depending on the method used and time taken to breakdown the starch, different grades of corn syrup with different percentages of glucose, maltose and higher oligosaccharides (dextrin) are produced. The glucose content can vary between 19-43% and up to 90%. A typical confectioner’s syrup contains 19% glucose, 14% maltose, 11% maltotriose and 56% higher oligosaccharides. Next What is all-purpose flour? That’s cool. In North America it’s mostly made of corn (maize). Good to know wheat is also commercial used to prepare corn syrup. Have a great week!